Are your Rock Band drums ready? Here is the global rundown of the PSN Store updates on February 28, 2008, the day before leap year. Here's a quick look at the virtual PSP interface in PlayStation Home v0.8.3. It provides News, Help, Communication, Gaming, and Setup access. It looks like PlayStation Home has been updated to 0.8.3. The new features were discussed in this previous post. Prototype from Sierra and Radical Entertainment. Watch as Alex Mercer, the Prototype, tears up New York City and it's citizens. He's somewhat a combination of Spiderman and The Terminator. The open world looks massive and the ability to control tanks and helicopters is unexpected. The videos are from 6 month old demos so we're expecting improvements when it's released in September. 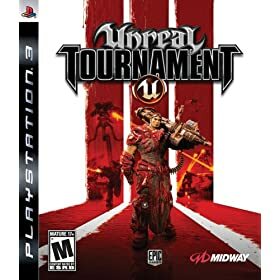 Lord Simeon brings us the Lego map for Unreal Tournament III, which is on sale for $49.99 at the moment. You can download the Lego map here. Is the format war over? Are you worried about global warming? Well the guys at Rock Star Games are. Here is the Karin Dilletante, the hybrid sedan, available in Gran Theft Auto 4. You can choose to save the environment while mowing down some bad guys. And no, it's not a Toyota Prius. Well we were wrong depending on filenames, Kuri is not the new female Street Fighter IV character, it is C. Viper. And another new SF4 character is named Abel. He seems to be a faster Zangief. Watch as someone chooses to be play as C.Viper vs Abel at the AOU Arcade Show in Tokyo. You can also see the characters available in SF4. The only thing we don't see are the bosses that you have to fight at the end. This new video from Radical and Sierra showing off Prototype seems to be cell-shaded animation. This differs from the previous video which seems bland in comparison. Now this is all speculation whether the game is headed in the cell-shading direction but it does change the visuals dramatically. Buzz! The Hollywood Quiz Contest starts now! God of War Chains of Olympus - Gold Rush!! The New Street Fighter 4 Character Kuri? Here's the newest Street Fighter 4 character. We believe here name is Kuri, but we're only going with the file name from Famitsu. She may have fast hands like E. Honda, a fireball like Ken and Ryu, or electricity like Blanka - we don't know. You can see new images of Chun Li, Guile, Dhalsim, E. Honda, Zangief, and Blanka in SF4 from Famitsu. Father of the PlayStation Honored at D.I.C.E. I was going through this website that I heard recolors devices. I found in when looking into getting my Sidekick LX recolored and noticed that they do the same for PS3s, 360s, even Wiis. With the exception of the Wii console, they let you either send in your already owned controllers or consoles, or buy directly from them with the color of your choice. So for those of you that have been waiting for the new colored PS3s to hit shelves, or if you're like me and feel that the original 60GB PS3 was the best released option(seeing as how it has everything from backwards compatibility to 4 USB ports, and external memory readers. ), you won't have to wait any more. From the looks of it, the initial pricing for a PS3 system is $99 for the system and the first controller, as long as they're the same color. Add $10 if you want the controller a different color from the system, and another $10 to have the normally silver section around the disk tray different from the system. $25 for each additional controllers, up to 4 controllers in total. That's just for the PS3, pricing for the other systems may be different. So, check it out for yourself. If you check out their Gallery, you'll notice that they have a few custom paint jobs, one with an Assassins Creed theme and a few others. I don't know if they offer that to customers or not, but it's worth a look to see how good a job they do though. Their Prototype section of the Gallery shows that they may be doing this service for Guitar Hero controllers soon as well. The website is ColorWare PC, check it out for yourself. The Twisted Metal Blog is live! Hey all! David Jaffe here again. Pleased to announce the launch of our first ever official Twisted Metal Blog/Website! Click on the link and check it out! Here are some updated screenshots of PlayStation Home from the Japan PSN Home website. You can see more of the Home UI at the website. What had been an enclosed room with a large window showing a lush view has now been transformed into a serene outside space, with plenty of room for people to interact, and tables with fully functional chess and draughts games included. Additionally the entrance points to key content areas - the Theatre and the Bowling Alley - have been redesigned so that they're much more recognisable. The Theatre itself, while retaining the same functionality, has had all of the screening areas moved down to the ground floor, after feedback from users that the 12 second walk to go upstairs took too long. Venables and Festejo also revealed that it was now possible to take your avatar out onto a balcony from your own apartment, and that there would be "around eight or nine" different apartments available at launch, although no new details on potential pricing options for the premium apartments were available. One of the premium rooms displayed was called Norwegian Lodge, a large wood cabin, much bigger than the basic apartment, and while all of the existing apartment designs were based on real-world locations, Festejo commented that he could see more fantastic options, such as a room in the clouds, becoming available should there be user demand for it. The reports are saying that Home is on track for a Spring release.